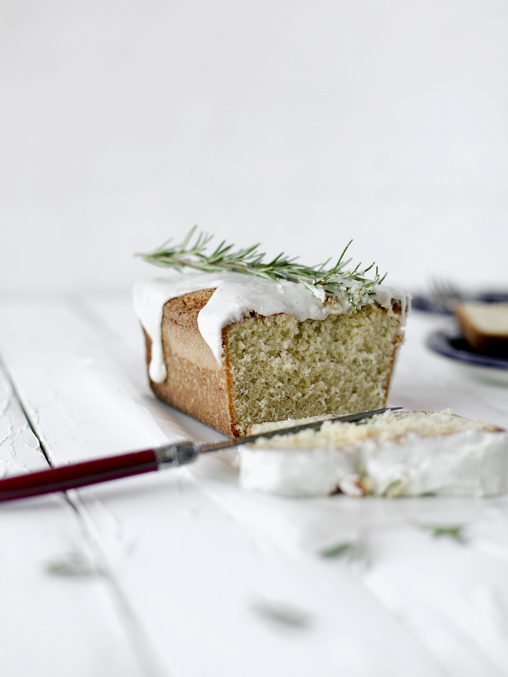 Rosemary Loaf Cake — always with butter. 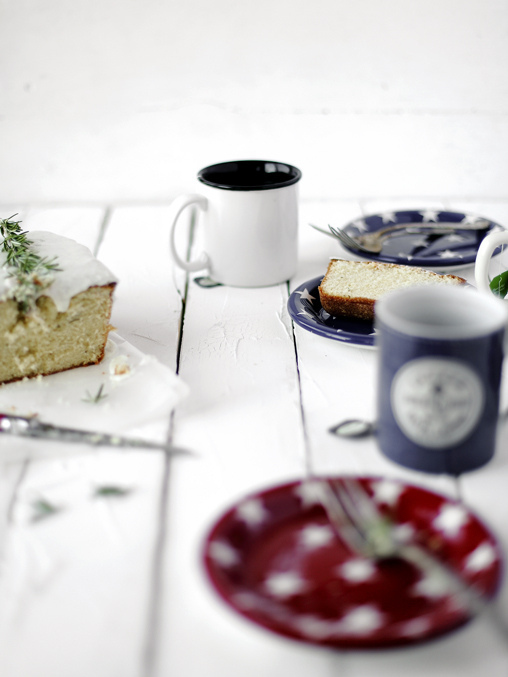 A nice simple pound cake, with a addition of fresh herbs. And it was delightful! I had originally seen this recipe in a copy of Martha Stewart Living. It was an article that featured the photography of Katie Quinn Davies. Of course, I was in love with every photo. As I always am with her work. She does something magical with her shots that I can never in my wildest dreams figure out what exactly it is. Some type of post processing? The best natural light? Wide aperture? Shallow aperture? I don't know. But they are all brilliant. Anyways, this loaf cake was featured in the spread and it was something I hadn't seen. I have used thyme, lemon verbena, basil in desserts but never rosemary. I always thought it went better with potatoes than cake. Then in on of my last CSA boxes, there was a big bundle of rosemary. I thought of this cake instantly. It had to be made. 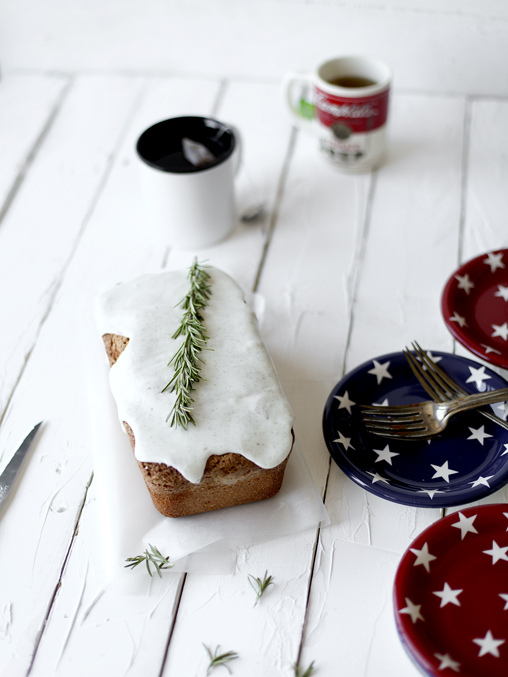 It is not very sweet, not too thick or buttery, and the rosemary permeates through the whole cake. Mine turned out to be unexpected. In a good way. The first 8 hours of my day were spent baking away at work. Making pies with star shaped dough pieces on top. Berry galletes, many cookies and then prepping many other things for the next day. I thought the rest of my day would be spent at home, just not doing much because I had work the next day. But then my phone rang and an old, friend, who I recently reconnected with invited me over to hang out. So the night was then spent watching episodes of each of the shows we currently liked. Breaking bad for him and Men at Work for me. Then trying to see some fireworks from the deck, unsuccessful. Only the tops could be seen from over all the trees. Then just catching up. Nice, quiet night but was great because it was with someone, up until a few ago, I thought I would never speak to again. Holy crap is it hot out. Not the highest temps it could be but there is no breeze so it's muggy as F in my house. Must jump into a cold shower before I pass out. Oven 350F. Butter and flour two 4 1/2 x 8 1/2 loaf pans. Sift both flours, baking powder and salt together into a bowl. Set aside. Combine butter, sugar, rosemary and vanilla in the bowl of a mixer. Beat until very light and fluffy, 5 minutes. Add in the eggs and white one at a time. Mix in half the flour mix, then half the milk. Add in the remaining flour then the final milk. Mix only until combined. Bake for 40-50 minutes until center is completely set. Mix together, adding just a dash of milk at a time until you get a think but pour-able consistency. Pour over the completely cooled cakes.